It’s as if someone said, “Kia makes some quality family transportation but that’s it,” and Kia said, “Hold my drink.” Kia took aim at the BMW 4 Series Gran Coupe and Audi A5 Sportback segment and gave it all they got. What Kia created surpassed everyone’s expectations. The result was the Kia Stinger, a 5-door liftback that goes zero to sixty in six seconds flat and proves Kia is not just a one-trick pony. In this preview guide, we’ll take a long look at the Stinger and what makes this fastback worth some attention. The 2019 Kia Stinger sports the quintessential tiger nose with honeycomb grille. The Stinger adopts a wide stance, keeping the car close to the road. Its sleek roofline gives the Stinger that sporty fastback look. The Stinger has its share of vents, winglets and elongated taillights. But the way the Stinger sets itself apart from the competition is by being quite a bit longer than the average fastback, 4 inches longer than the Audi A4 and over 7 inches longer than the BMW 3-series. The Stinger is also a hair wider and the lowest, giving you extra space while leaving an unforgettable impression. Another upside? How about 40 cubic feet of cargo space in a fastback! The 2019 Kia Stinger doesn’t just look sporty. Take a look under the hood, and you’ll find a 255-horsepower turbocharged 2.0-liter four-cylinder generating 260 pound-feet of torque or an optional twin-turbo 3.3-liter V-6 that makes 365 horsepower and 376 pound-feet of torque. Either engine option comes with a eight-speed automatic transmission. There’s no manual option, but the automatic transmission is responsive and there are wheel-mounted paddle shifters for those so inclined. As we said, you can get to zero to 60 in just six seconds with the base engine. But with the optional twin-turbo, that number improves to an outstanding 4.4 seconds. With its sporty handling, tuned suspension, and vise-like grip to the road in the tightest of turns, the Stinger is a thrill ride to drive. Kia took careful notes when studying European fastbacks in preparation for designing the Stinger. One thing they made sure to not leave out was tech. Right out of the gate, you get leather upholstery including steering wheel and shift knob, push-button ignition and keyless entry, power driver and passenger seats, dual-zone climate control, and 7-inch touch-screen audio system with Apple CarPlay and Android Auto. For safety features, you get front and rear parking sensors, blind-spot warning, rear cross-traffic alert, rearview camera with dynamic guidelines, and Brake Fade Compensation. The 2019 Kia Stinger brings European-style fastback to the Kia lineup. 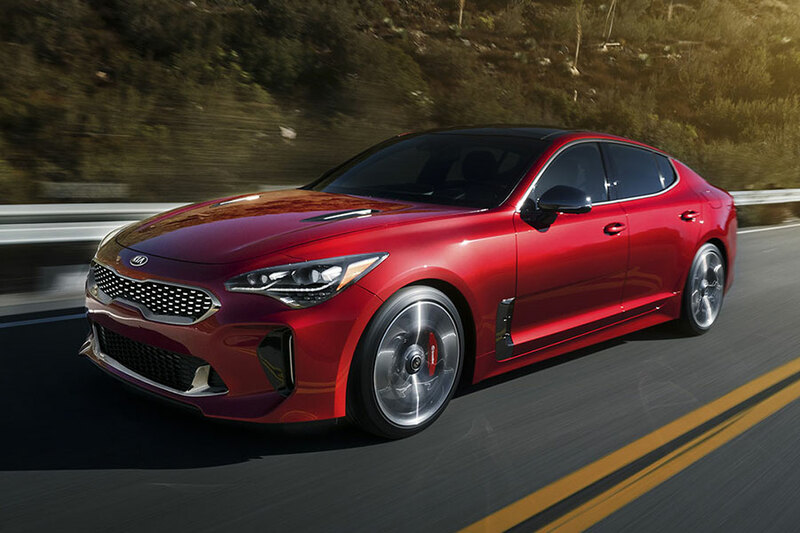 If you’re a collector, you should know that the Kia Stinger Atlantica, a limited edition G2 trim has been delayed indefinitely, but other Stinger exclusives are no doubt in the works. But we’re not complaining here because any Stinger is an outstanding car.